With it’s unforgettable views, beautiful decor, and full list of amenities, Closer to Heaven has the allure of a private mountain paradise away from it all. 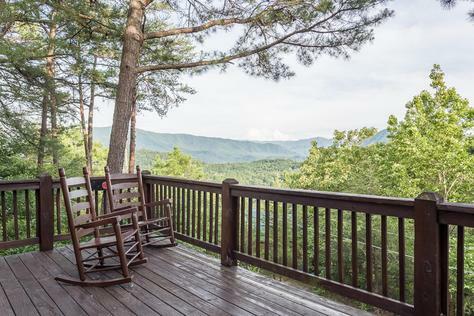 Tucked away within the Hickory Hollow Resort Community yet minutes away from so many wonderful attractions and the beautiful National Park, Closer To Heaven is your ultimate mountain getaway that offers a perfect blend of privacy and convenience. Pictures can’t truly show the full beauty overlooking famous Wears Valley, but perched 1,950 ft. in elevation and nestled in the foothills of the Smoky Mountain National Park, Closer To Heaven offers these picturesque views from almost every location on the property. Wake up in the beautiful master suite to the sound of wildlife just steps away. Enjoy your morning coffee while sitting on the masterfully crafted log picnic table and listen to the chirping birds, chattering squirrels, and abundance of other wildlife within the area. Especially relevant is that all of this is within view of the breathtaking Smoky’s. Peaceful rain showers can be enjoyed under the covered porch in addition to the one-of-a-kind reading nook that no other Wears Valley cabin rentals offer. While situated at the end of a small catwalk and looking through the crystal clear floor to ceiling windows, you can enjoy the tree framed view while reading your favorite book. Also, after long days of hiking and seeing the attractions, a night of rejuvenation is a must! Offering privacy and relaxation, take some time to unwind in the hot tub that sits upon the back deck overlooking the trees and the mountains. The Chef within you can whip up any meal you’d like in the fully equipped kitchen or over the hot coals of the BBQ grill. Also enjoy a nice glass of wine from one of the local wineries and get a taste of the area! Give yourself the vacation you truly deserve by booking one of the best Wears Valley cabin rentals in the Smoky’s…Closer To Heaven! Whether you’re looking for a romantic couples retreat or a family getaway, Eagle’s View is the cabin for you! 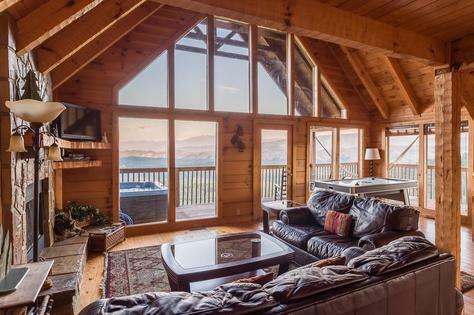 As one of the best Pigeon Forge cabin rentals in the area, it sits perched atop the peak of Bluff Mountain and offers views that simply cannot be matched. Panoramic views spanning 180 degrees offers little to the imagination. Stretching from Pigeon Forge to Gatlinburg, you can sit back and take everything in from the viewpoint of a soaring Eagle. Eagle’s View is an upscale luxury cabin offering everything one could need, making it feel like a home away from home. With it’s tasteful rustic decor, full list of amenities, and the feeling of total privacy, guests can be assured that this is the cabin for them. Eagle’s View is the last cabin on the road ensuring a feeling of seclusion and privacy. Location is key in the Smoky’s as being close to the attractions is a must. Unlike many Pigeon Forge cabin rentals, Eagle’s view is located only 5 miles from downtown Pigeon Forge while still maintaining that aforementioned privacy. Feel like staying in for the day? Enjoy the amenities the cabin has to offer such as a game of air hockey, or a relaxing day of lounging in the hammock while taking in all the picturesque views. Pop in your favorite movie,stream Netflix or just relax in one of the rocking chairs or hammock located on the covered deck. After long days of touring the area and hiking, a well deserved soak in the hot tub is a must! Rain or shine, it’s always ready. The fully equipped kitchen begs for the chef within you to whip up your favorite meal, while a BBQ pit awaits outside for those who enjoy grilling! Once your day is over and sleep is on the menu, know that a luxurious and cozy king bed awaits in the loft. Fall asleep in the piece and quiet of the Smoky’s and wake up with a feeling of serenity. Overlooking the wall of windows and the reaches of the beautiful mountains, the view from the loft is unparalleled. As you lie in the King bed, look to your right and watch the city of Pigeon Forge glow. It is surreal…there is no better place to awake and it is a great way to start and end the day. The same can be said when relaxing in the large jacuzzi tub which is located in the loft as well. Book your one of a kind Smoky Mountain getaway with a stay in Eagle’s View. You won’t be disappointed and remember, Your vacation is our priority! With it’s unforgettable views, full list of amenities, beautiful decor, and incredibly stunning views, Big Bear Point has the allure of a private mountain paradise away from it all…yet is close to everything! Tucked away within Bluff Mountain Acres, it is minutes away from all of the attractions as well as the beautiful Smoky Mountain National Park. 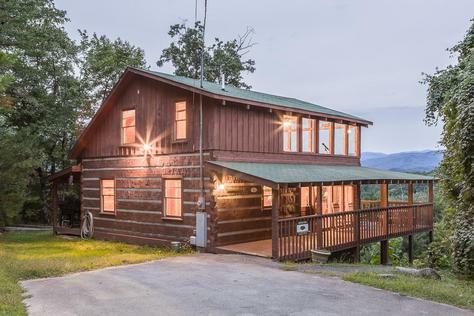 Big Bear Point is one of our best Pigeon Forge vacation rentals that offers a perfect blend of privacy and a great location. Whether you’re looking for a romantic couples retreat or a family getaway, Big Bear Point is the cabin for you! Views looking out for miles over the beautiful mountain offers little to the imagination. Enjoy the views during the day with the telescope or use it at night to look at the crystal clear evening sky. Big Bear Point is an upscale cabin offering everything one could need, making it feel like a home away from home. With it’s tasteful rustic decor, hand hewn pine walls, deck, and floors, full list of amenities, and the feeling of total privacy, guests can be assured that this is the cabin for them. Tucked into a private section of woods, it offers the seclusion and privacy that many long for in a mountain retreat. Location is key when choosing from a list of Pigeon Forge vacation rentals and being close to the attractions is a must. Big Bear Point is located only 5 miles from downtown Pigeon Forge. Feel like staying in for the day? Enjoy the amenities the cabin has to offer such as a game of pool or darts, the arcade machine which includes 60 classic games (free to play), take in the picturesque views through the telescope and look deep into the mountain landscape, or enjoy the rocking chairs, swings, or hot tub on the back porch in rain or shine. You could also pop in your favorite movie, stream Netflix or build a fire to nestle up to on cold winter days. The fully equipped kitchen begs for the chef within you to whip up your favorite meal, while a both a gas and charcoal BBQ pit awaits outside for those who enjoy grilling! Give yourself the vacation you truly deserve by booking on of the best Pigeon Forge vacation rentals today!